Nebraska had only eight returning starters in 1983, four on each side of the ball. The four on offense were imposing, however: I-back Mike Rozier, wingback Irving Fryar, guard Dean Steinkuhler and most importantly, quarterback Turner Gill, a third-year starter. 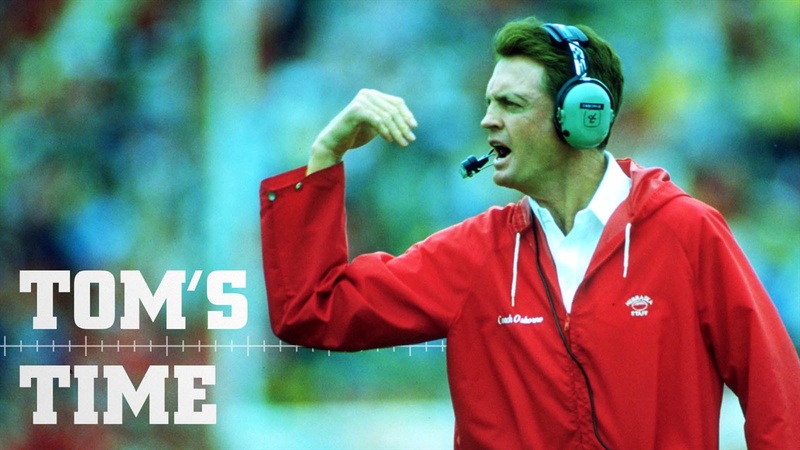 Tom Osborne wouldn’t have agreed to play in the first Kickoff Classic without an experienced quarterback. The Huskers would play in two more Kickoff Classics, in 1988 and 1994. Steve Taylor was a senior in 1988, Tommie Frazier a junior in 1994. Both were third-year starters at quarterback. That Nebraska was invited to the inaugural Kickoff Classic was logical. The game featured defending national champion Penn State, which had handed the Huskers their only loss in 1982. Plus, Osborne’s 11thteam was preseason-ranked No. 1 – Penn State was No. 4. The New Jersey Sports & Exposition Authority had asked the NCAA to allow such a preseason game to be played at Giants Stadium in the East Rutherford, New Jersey, Meadowlands in 1978. East Rutherford is just across the Hudson River from midtown New York City. The NCAA denied the petition, however. The full membership had to approve a 12thregular-season game, and not everyone was on-board until five years later. The game also allowed for an additional television appearance, another consideration at the time. Katz Sports won the telecast rights, out-bidding NBC, Turner and Mislou/ESPN. Curt Gowdy handled play-by-play, with Lee Corso as color analyst. CBS handled the national radio broadcast, with Lindsey Nelson and Jim Kelly – not the NFL quarterback out of Miami, or course. Nebraska allowed only a single radio network for the first time that season, Omaha’s KFAB. There had been three others in 1982: WOW in Omaha, KFOR and KLIN in Lincoln. Lyell Bremser handled KFAB’s play-by-play, in what would be his final season. Kent Pavelka, his successor, was also in the booth, with Gary Sadlemyer on the sideline. Kickoff was scheduled for 9 p.m. (Eastern) – actual time was 9:11 – on Aug. 29, a Monday. Attendance was 71,123. Giants Stadium’s listed capacity was 76,891. According to the official play-by-play, temperature at kickoff was 74 degrees, with a 6-mph wind. The weather was “clear” it said. But there was a downpour during the first quarter. After a three-and-out on the game’s first possession, Nebraska drove 78 yards on 12 plays for a touchdown, with Gill sneaking the final yard. Dave Schneider’s kick made it 7-0, with 4:54 remaining in the first quarter. The drive consumed 7:11. That set the tone. Penn State managed two first downs on its second possession before middle guard and co-captain Mike Tranmer’s sack forced a punt to the Husker 14-yard line. Nebraska needed just seven plays, including a 34-yard run up the middle by fullback Mark Schellen, to score a second touchdown on the final play of the quarter, with Gill passing 7 yards to tight end Monte Engebritson. Schneider added the extra-point – Nebraska 14-0. Back-up quarterback Nate Mason passed 20 yards to tight end Todd Frain for a touchdown late in the first half, and Schneider’s kick made the score 21-0. The Huskers would put up 44 points before Penn State managed to get on the scoreboard with 20 seconds remaining. Sophomore corner Todd Fisher blocked the extra-point kick – final 44-6 Nebraska. Gill, who completed 11-of-14 passes for 158 yards and rushed for 53 yards on 13 carries, was named the game’s outstanding offensive player, Husker linebacker Mike Knox the outstanding defensive player. Knox had five tackles, including one for loss, and intercepted a pass, returning it 27 yards for a touchdown early in the third quarter. Nebraska fumbled nine times but lost only one. Penn State lost one-of-five fumbles. “We were tired of hearing how great Penn State’s defense was,” Husker defensive ends coach George Darlington said. The Nittany Lions would lose their next two games to Cincinnati and Iowa, fall out of the rankings, and finish with an 8-4-1 record. Excitement over the victory was such that UNL students set bonfires in the streets near campus in the early-morning hours of Tuesday. There would be cause for more celebration as the season progressed.